HALLIE EPHRON: Memorial Day. The day we honor those who died in the military and, on a lighter note, a day off from work that gives us a good excuse to parade and picnic. In my town there's a parade. My daughter played the flute in her high school band, and every year she was mortified at having to get dressed in her red band jacket and bow tie and march. It was either beastly hot or raining. There'd be a flag raising (including the POW/MIA from the Vietnam War flag), pauses in front of our World War I and Civil War memorials, and a parade to the cemetery where the little ceremony was always heartfelt and moving. Our town cemetery (photo by Bill Ilott) is beautiful. 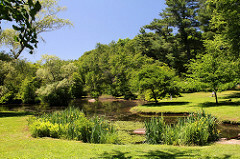 It has a pond and winding paths, and the oldest part dates back to the early 1700s. On Memorial Day the dogwoods and cherry blossoms and tulips are blooming and the pond is teeming with geese and their goslings, and turtles jockey for position, sunning themselves on the rocks. What happens on Memorial Day in your neck of the woods? LUCY BURDETTE: We have a beautiful old cemetery in our town too, with stones as old as the 1700's. There's a small parade from downtown Madison to the cemetery and a lovely service. This year John's and my wedding anniversary falls on Monday and we'll celebrating that, at least by eating something good:). Later on in June, we'll go to New York for the real celebration. We're already tussling about whether I can hit the same two places I like to go every time (the Strand Bookstore and Eataly), or whether I have to try something new:). HANK PHILLIPPI RYAN: I always cry at the parades. So emotional. We have no idea. Boston Common is filled with American flags, one for each person from Massachusetts who's died in a war. It is a SEA of flags. We'll be home, and I think one must have grilled-out hamburgers. I'll also be working, gotta do my words. On that lighter note, we can now wear white pants, and have gins and tonics. Happy Anniversary, Roberta and John! What number? DEBORAH CROMBIE: Yes, happy anniversary, Roberta and John! Love your description of the "sea of flags", Hank. It made me think of the time I went to the American Cemetery outside Cambridge (UK, not Boston!) It is a sea of white crosses on a curving sweep of green lawn. So beautiful, so moving. 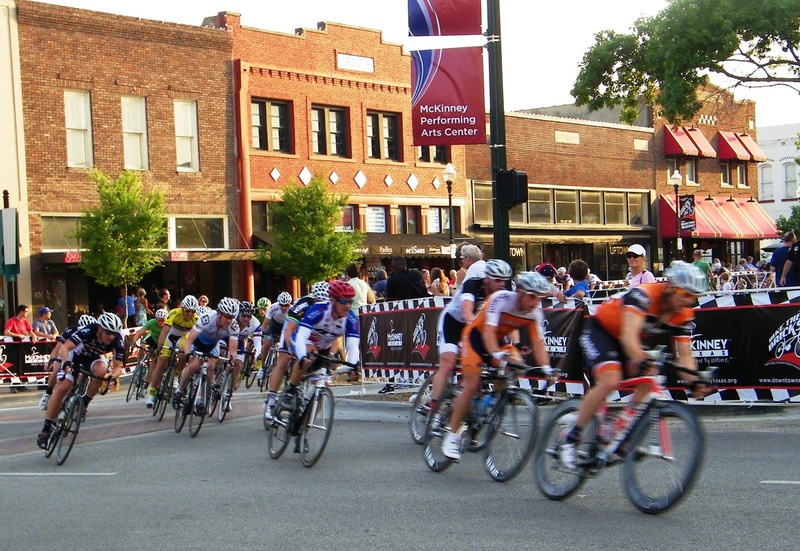 The big Memorial Day thing in our town is a charity fund-raiser bike race on Friday. It's called Bike the Bricks and goes through our historic town square. There are food vendors and music and lots of fun activities, but unfortunately it was canceled this year due to our horrible weather. RHYS BOWEN: I'll be missing Memorial Day this year. I'm in Tuscany, leading a writers' workshop. Back home my church choir is always asked to sing at a special service at a local cemetery, but I always find it superficial, somehow. What does move me is to walk through military cemeteries and see those names and the ages, 18, 19... Not much older than my grandson. SUSAN ELIA MACNEAL: Happy anniversary, Roberta and John! 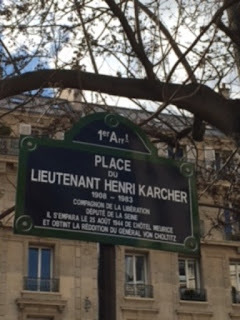 I'll be working on my novel, THE PARIS SPY — but I'll be thinking especially of the men and women of the SOE, of the French Resistance. In particular, I'll be remembering Lieutenant Henri Karcher—his memorial was right outside my hotel in Paris and was the first thing I saw when I started my research. I took it as a good omen. HALLIE: Let us know what Memorial Day is like in your neck of the woods, while we remember the soldiers who didn't come back and are grateful for the ones who did. A day for remembering . . . Here that includes a parade and a ceremony at the cemetery. This year rain will make it difficult to grill, but we'll still have a hamburger and potato salad meal. We called it Decoration Day when I was small. My grandmother cut flowers from her garden, lilacs, mock orange, iris, whatever was blooming, arranged them in quart mason jars, and off we went to the cemetery. We put them on all the family graves, and there were a lot of them. In particular she made sure I went to the grave of my paternal grandmother, whom I never knew. And she told me Grandma Lettie was watching over me every minute. Yikes, did that ever end the nose picking for good. Today Julie and I will visit her family graves and plant a few pansies that will possibly survive winter on the tundra. Ann, thank you for telling of your Decoration Days...much like my family tradition. You have stirred good memories for me. I'm in book jail (book due June 1), so I'll be working, too! Plus its raining. I hope to get out and plant some flowers if it stops, and make a strawberry-rhubarb pie, too. Happy anniversary, Roberta! Ann, I love your remembrances... especially visiting the grave of a grandmother whom you never knew. Speaking for me, death isn't as scary as being forgotten. Here in New England it's a dreary day - rain and in the 50s. Yesterday it was hot and 91, and our cemetery was teeming with families visiting graves, knowing today would be a washout. Parades through town to the cemetery--ours and the neighboring town--we have to schedule one after the other because we share a high school and the band! The band plays by the memorials to the war dead. It is always moving--it always makes me cry. My mom told us often of decorating the graves in the family cemetery--tucked away on a ridgetop in eastern Kentucky. I will go to the cemetery here much later, after the parades, when it is quiet. Ann, the crosses at Normandy blew my mind. I think I cried all the way around the space. We are driving in the rain, heading home from a weekend on the Cape. Which was fabulous! It is a dreary day, and good for staying inside, and good for remembering. Decoration Day-- yes, how sweet… I haven't heard that for a long time. We remember family now departed, but there are no graves (cream aged), so we just remember them in our hearts. It will be high 70s and beautiful here, so time in the garden, then ribs cooked low and slow, potato salad (yesterday's recipe) and apple pie. Dang, that was supposed to be "creamated "
Very dark here, more thunderstorms in the forecast. Fingers crossed we actually get to cook those fancy Waygu beef hotdogs on the grill. I love the stories about Decoration Day. I'd never heard that, and obviously my family didn't do it. What a sweet tradition. The Boy is a scout, so he's always in the local parade. Actually, his day starts much earlier. They have a service at the river around 6:30am to honor those who died at sea. Next is breakfast at the firehall. Then the parade. It pauses at two war memorials on the route and ends in the Oakmont cemetery which is not new, but I'm not sure how old. The hardest part of the walk is the last part - straight up a hill. Some years it's so hot it's a brutal walk, but this year is not bad. Sunny, but only 60 degrees. I used to walk the route, but now...not so much. So I start the day with The Girl. We go to the local bakery for pastries and chai lattes. Then we watch the parade and drive up to the cemetery to pick up the menfolk, drop them back at the parade start (to get the hubby's car). Then home for grilled whatever and hanging with the neighbors. Richard, don't you love autocorrect? Mary, sounds like a nice place to live. Happy anniversary Roberta and John! Decoration Day! My parents called it that throughout their lives. 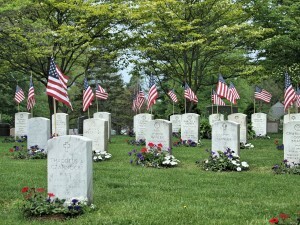 The towns I grew up in had no cemeteries so I always knew it as Memorial Day. It's a gorgeous day here in central Florida sunny and hot, but afternoon storms are expected so we cooked breakfast out and are planning fajitas for dinner. Always good to have a plan "B." I too am working on the word count, and this is the first town I've ever lived in that has no Memorial Day celebration. Flags mysteriously appear at the War Memorial. So there is no temptation to wander out. Happy Anniversary to you, Roberta and John! Enjoy your day and your later trip to New York. I think it was yesterday's post I described how Memorial Day was when I was a kid, and it was like Ann's, except it was my mother cutting flowers from her garden. I didn't realize until much later how interesting it was that my father was very much involved in making sure there were enough flowers. He was absolutely as focused as my mother was on it, and later, I began to think that maybe he was a bit of an aggravation to my mother, although she never said anything. As my grandparents were dead when I was born, going to the cemetery on this day was an important connection for me, and my mother would talk about her parents as we placed the flowers. I also remember the name "Decoration Day" being used. Wouldn't Decoration Day makes a good title for a novel?